Propranolol is an adrenergic beta-antagonist that is used for the treatment of hypertension, tremors, and prophylaxis of migraine and heart attacks. The drug is available under generic name Propranolol and various brand names such as Inderal, Inderal LA, Avlocardyl, Deralin, Dociton, Inderalici, InnoPran XL, Sumial, Anaprilinum and Bedranol SR.
Propranolol was discovered in 1960s by James W. Black. Propranolol is manufactured by Wyeth Pharmaceuticals and marketed by Akrimax Pharmaceuticals. Propranolol is also manufactured and marketed by Abbott Healthcare Pvt. Ltd. under licence of AstraZeneca. Propranolol is also manufacture by Cipla under the brand name Ciplar and Ciplar LA. 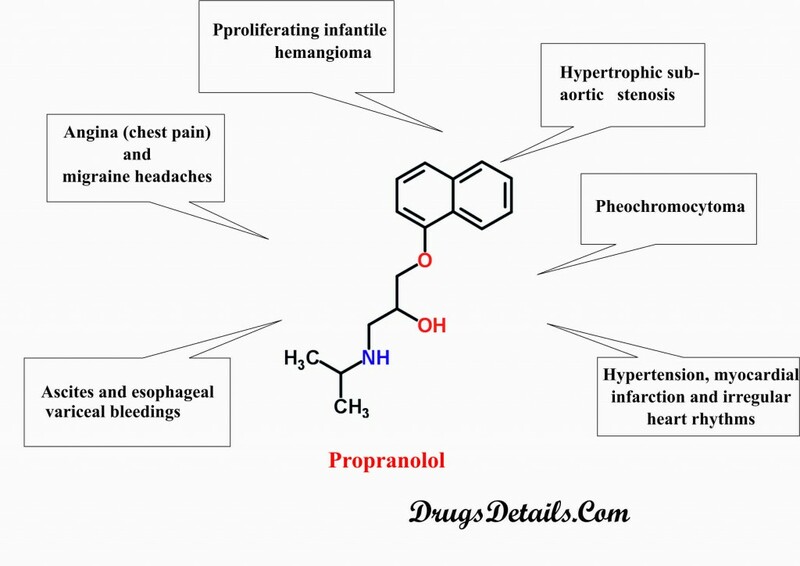 Propranolol : Structure and chemical information. Propranolol is a synthetic (man-made) pharmaceutical antihypertensive agent. Propranolol plays a key role in the treatment of complications related to the high blood pressure. Propranolol is used to treat hypertension, myocardial infarction and irregular heart rhythms. Propranolol is prescribed for the treatment of pheochromocytoma (tumor of adrenal glands). Propranolol is also prescribed for the treatment of proliferating infantile hemangioma and hypertrophic subaortic stenosis. Propranolol is used in the prevention of angina (chest pain) and migraine headaches. Propranolol is also used in the prevention of ascites (accumulation of fluid in the abdominal cavity) and esophageal variceal bleedings. Propranolol is available as a monohydrochloride salt which competitively blocks the beta-adrenergic receptor. It is a synthetic pharmaceutical aromatic homopolycyclic compound with a molecular formula C16H21NO2. The molecular weight of the compound is 343 g/mol. Chemically, Propranolol HCl is 1-(naphthalen-1-yloxy)-3-[(propan-2-yl) amino] propan-2-ol. 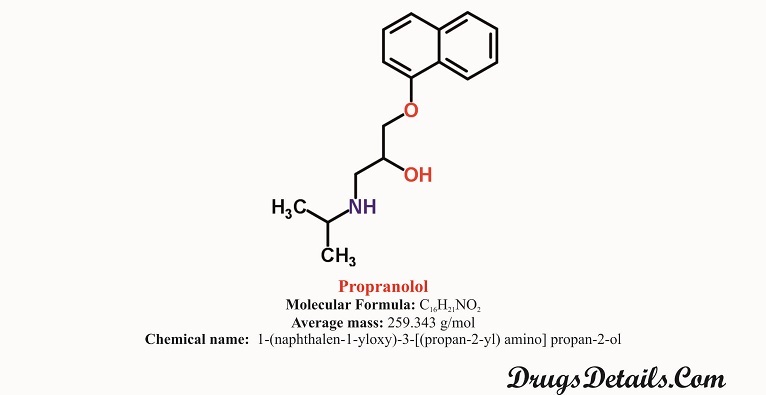 Propranolol is stable, white in color, crystalline, and solid in texture and has a water solubility of 7 mg/L at 25°C. Propranolol HCl is practically insoluble in ether and slightly soluble in chloroform. The melting point of Propranolol HCl is 96°C. Propranolol is available as tablet, extended-release capsule for oral administration and solution form for oral as well as IV administration. Propranolol tablet (Inderal®) is available in different dosage strengths of 10, 20, 40, 60 and 80 mg/tablet. The Propranolol tablet (Inderal®) is embossed with “I” on one side and imprinted with “INDERAL 10”, “INDERAL 20”, “INDERAL 40”, “INDERAL 60” and “INDERAL 80” on another side corresponding to the different doses of the drug respectively. 10 mg: Hexagonal-shaped, orange in color, scored tablet. Inactive ingredients: stearic acid, magnesium stearate, microcrystalline cellulose, lactose, FD&C Yellow No. 6 and D&C Yellow No. 10. 20 mg: Hexagonal-shaped, blue in color, scored tablet. Inactive ingredients: stearic acid, magnesium stearate, microcrystalline cellulose, lactose and FD&C Blue No. 1. 40 mg: Hexagonal-shaped, green in color, scored tablet. Inactive ingredients: stearic acid, magnesium stearate, microcrystalline cellulose, lactose, FD&C Blue No. 1, FD&C Yellow No. 6 and D&C Yellow No. 10. 60 mg: Hexagonal-shaped, pink in color, scored tablet. Inactive ingredients: stearic acid, magnesium stearate, microcrystalline cellulose, lactose and D&C Red No. 10. 80 mg: Hexagonal-shaped, yellow in color, scored tablet. Propranolol capsule (Inderal®-LA) is available in different dosage strengths of 60, 80, 120 and 160 mg/capsule. Each Propranolol capsule (Inderal®-LA) contains Propranolol hydrochloride as active ingredient and microcrystalline cellulose, ethylcellulose and hydroxypropylmethylcellulose as inactive ingredients. 60mg: white/light blue capsule imprinted with “INDERAL LA 60”. Capsule shell contains: gelatine, titanium dioxide, FD&C Blue 1, FD&C Red 28, white ink. 80mg: light blue capsule imprinted with “INDERAL LA 80”. Capsule shell contains: gelatine, titanium dioxide, FD&C Blue 1, FD&C Red 3, white ink. 120mg: light blue/dark blue capsule imprinted with “INDERAL LA 120”. Capsule shell contains: gelatine, titanium dioxide,FD&C Blue 1, FD&C Red 3, white ink. 160mg: dark blue capsule imprinted with “INDERAL LA 160”. Capsule shell contains: gelatine, titanium dioxide,FD&C Blue 1, white ink. Propranolol solution is available in two different dosages of 20mg and 40mg/5mL. Propranolol oral solution contains Propranolol hydrochloride as active ingredient and disodium edetate, methylparaben, propylparaben, citric acid, propylene glycol, sorbitol and water as inactive ingredients. Propranolol is a non-selective, competitive blocker of beta (1)-adrenergic receptors. Propranolol competes with sympathomimetic neurotransmitters such as catecholamines. Catecholamines such as Dopamine, Norepinephrin and Epinephrine are released by adrenal gland under physical and emotional stress. Propranolol competitively binds with beta-adrenergic receptor and inhibits the sympathetic stimulation. This inhibition results in reduction in resting heart rate, systolic and diastolic blood pressure, cardiac output and reflex orthostatic hypotension. The prescribed dose of Propranolol varies depending upon the age and diseased state of the patient. Immediate-release: Initial dose is 40 mg twice a day for 3-7 days and maintenance dose is 80-240mg daily. Sustained-release: Initial dose is 80 mg once a day and maintenance dose is 120-160mg daily. XL sustained-release: Initial dose is 80 mg once a day and maintenance dose is 80-120mg daily at bedtime. Immediate-release: 80-320 mg orally in a day divides into 2-4 doses. Sustained-release: 80mg once a day orally. Immediate-release: Initial dose is 80 mg daily in divided doses and maintenance dose is 80-240mg daily. Sustained-release: Initial dose is 80 mg once a day and maintenance dose is 160-240mg daily. Pheochromocytoma: 60mg daily in divided doses. Immediate-release: 20-40 mg for 3-4 times orally in a day. Sustained-release: 80-160 mg once a day. Myocardial infarction: Initially 40 mg thrice a day orally and then increase to 60-80mg thrice a day orally. Initial dose: 40mg twice a day orally. Maintenance dose: 120-320 mg orally in a day. Immediate-release: 10-30 mg thrice a day orally. IV administration: 1-3 mg at 1mL/minute and after 2-5 minute repeat to total of 5 mg.
Panic Disorder: 40-320 mg per day orally. Aggressive Behavior: 80-300 mg per day orally. Antipsychotic-Induced Akathisia: 30-120mg thrice or twice a day orally. Esophageal Variceal Bleeding: 20-180mg twice a day orally. Initial dose:6mg/kg or 0.15mL/kg for 7 days. Maintenance dose: 1mg/kg (0.3mL/kg) for 14 days and then 1.7mg/kg (0.4mL/kg). Initial dose:0.25-0.5mg/kg twice daily for 5-7 days. Maintenance dose: 1-2mg/kg twice daily. Initial dose:5-1mg/kg daily divided into 3 doses for 3-7 days. Maintenance dose: 2-6mg/kg daily (maximum 60 mg/day). Initial dose:5-1mg/kg daily divided into 3 doses. Maintenance dose:01-0.1mg/kg daily over 10 minute. Repeat in 6-8 hours. Neonates: 2mg/kg daily divided into 3-4 doses. Adolescents: 2.4-10mg/dose in every 6 hours. Oral Administration: 1mg/kg daily divided into 4 doses for 7 days. IV administration:01-0.2mg/kg daily over 10 minute. Immediate-release: Initially 40 mg twice daily orally and then 80-240 mg twice daily. Capsule: initially 80 mg once a day orally and then 120-160 mg once a day oral maintenance dose. Oral dose: 10 mg thrice daily orally. IV dose: Initially 1-3 mg at 1mg/minute and then 2-5 minute to total of 5 mg. When should I discontinue, withhold or modify the dose of Propranolol? Do not use the medicine if you are allergic to Propranolol or any of the ingredients present in the Propranolol product. Propranolol should be used with precaution in case of hepatic impairment. No dose adjustment is required in case of renal impairment. Propranolol is contraindicated in case of cardiogenic shock, bronchial asthma and sinus bradycardia. Seek advice from your pharmacist or doctor if you have Diabetes mellitus, hyperthyroidism, Peripheral vascular disease or Myasthenia gravis. The drug is also contraindicated in conditions such as asthma, sick sinus syndrome and severe hypotension. Propranolol is contraindicated with the use of other drugs such as Warfarin, calcium channel blocker (Diltiazem, Nicardipine, Nisoldipine and Nifedipine), cholesterol lowering agents (Lovastatin and Pravastatin), antacids contains aluminium (Maalox, Mylanta), anticoagulants and Cholestyramine. Propranolol is also contraindicated with depression medications (Bupropion, Paroxetine, Fluoxetine and Imipramine), medications for migraine headache (Rizatriptan and Zolmitriptan), medication of high blood pressure (Terazosin, Clonidine, Doxazosin and Prazosin), medications for irregular heartbeats (Propafenone, Amiodarone and Quinidine), and monoamine oxidase such as Phenelzine and nonsteroidal anti-inflammatory drugs such as Indomethacin. Pharmacokinetic studies suggested that after oral administration, Propranolol is almost completely absorbed in GI tract and has a bio-availability of approximately 26%. It has been observed that following a single dose of maximum (or peak) plasma concentration is achieved in 60-90 minutes in the fasted state. Following absorption the majority (>90%) of the drug is bound to plasma proteins. The drug is mainly metabolized by the hepatic enzyme CYP450 1A2 and CYP450 2D6 through aromatic hydroxylation, N-dealkylation and glucuronidation. Propranolol is primarily excreted in the urine in the form of metabolites (42% through aromatic hydroxylation, 41% through N-dealkylation and 17% through glucuronidation). Which pregnancy category (A; B; C; D; X) has been assigned to Propranolol? Due to lack of adequate and well-controlled studies the use of Propranolol in pregnant women is contraindicated and recommended only when benefit justifies the risk. Propranolol shows adverse effect on fetus and may cause decreased placental perfusion, fetal or neonatal bradycardia and hypoglycemia. Studies support the excretion of the beta-blockers into milk. However, Propranolol is present in human breast milk at very low levels. Despite these facts caution should be exercised when taking Propranolol during pregnancy. How to use the drugs? Propranolol is available in tablet, extended release capsule and oral solution form for oral administration by mouth with or without food. Co administration of Propranolol with food may enhance the bioavailability of the drug. Extended release capsule should be taken once a day at bedtime always with or always without food. Propranolol tablets or oral solution may be taken 2 to 4 times in a day. Propranolol tablets and extended release capsule should not be chewed, split or crushed, but swallowed as a whole. Do not change the dose of the drug as prescribed by your doctor as your doctor may decrease the dose of Propranolol depending upon adverse side effects or medication response. If you have any queries about the drug immediately consult to your doctor to get information about any part you do not understand. Propranolol is stored at room temperature 25°C (77°F). Brief excursion period is permitted to 15-30°C (59-86°F). Store the medicine away from direct sunlight, excess heat and moisture. How to dispose Propranolol ? Does Propranolol has approval from government / FDA /or any other related agencies? Propranolol has received its official approval from US Food and Drug Administration (FDA) in November, 1967 to treat medical complications such as hypertension, chest pain, tremors, heart rhythm disorder and other circulatory conditions. Propranolol is also used in the treatment of post-traumatic stress disorder. Propranolol is often used to decrease own hand tremors during surgery by surgeons. Propranolol may also be used for other uses not listed here. It is advisable to ask your doctor or pharmacist for more detailed information regarding its use. Propranolol medication should not be stopped suddenly and avoid to skip the dose. Use of tobacco, tobacco products and smoking should be avoided during the medication of Propranolol because it may decrease the effectiveness of the drug. In addition to the associated benefits, Propranolol also is accompanied with the side effects some of which are more common, others less common whereas some that fade away with time while you take the drug. It is always recommended to consult a doctor if you encounter any of the side effects. Cardiovascular effects: cold extremities, hypotension, heart failure, exacerbation of claudication, raynaud’s phenomenon (excessively reduced blood flow in response to cold or emotional stress). Gastrointestinal effects: nausea, anorexia, flatulence, loss of appetite, vomiting, diarrhea, abdominal pain. Haematological effect: thrombocytopenic and non-thrombocytopenic purpura, eosinophilia, agranulocytosis, decline of platelet adhesiveness. Hypersensitivity effects: contact dermatitis, anaphylaxis. Nervous system effects: Fatigue, nightmares, irritability, sleeps disturbances, agitation, paresthesia, dizziness and seizure. Ocular effects: visual disturbance, eye dryness. Renal effects: renal insufficiency (low systemic blood pressure). Overdose of Propranolol may cause hypotension, bradycardia, bronchospasm and acute cardiac failure. Propranolol may interact with one of the following drugs. Care should be taken when you are taking these medications together. Substrates or Inhibitors of CYP2D6 including including cimetidine, quinidine, ritonavir, paroxetine, amiodarone, and fluoxetine. However, there is no interaction in presence of ranitidine or lansoprazole. Substrates or Inhibitors of CYP1A2 including zileuton, theophylline, ciprofloxacin, cimetidine, ritonavir, zolmitriptan, imipramine, rizatriptan, and fluvoxamine. Substrates or Inhibitors of CYP2C19 including cimetidine, tolbutamide fluoxetine, fluvoxamine, tenioposide, and fluconazole. However, there is no interaction in presence of omeprazole. Inducers of Hepatic Drug Metabolism: The inducers of hepatic drug metabolism (such as ethanol, rifampin, phenobarbital, and phenytoin) when co-administered with Propranolol result in a decrease in the concentration of the drug in blood. Besides, smoking also causes a tremendous clearance of the drug upto 77% thereby lowering its plasma levels. Antiarrhythmics: Propafenone is associated with negative inotropic and beta-blocking properties that cause a cumulative effect when co-administered with Propranolol. Quinidine reduces the metabolism and thereby increases the blood levels of Propranolol causing higher levels of beta blockade resulting in postural hypertention. The metabolism/clearance of Lidocaine gets reduced when co-administered with Propranolol and therefore causing an increase in its concentration and associated toxicity. Amiodarone possess negative chronotropic properties that add to the beta blocking properties of Propranolol. Calcium Channel Blockers: Calcium channel blockers are associated with negative inotropic and/or chronotropic effects and hence caution should be taken when they are co-administered with beta blockers such as Propranolol. Their cumulative effects result in enhanced depression of myocardial contractility or atrioventricular conduction. Concomitant use of verapamil and Propranolol may cause heart failure, bradycardia, and cardiovascular collapse. Patients of cardiac disease when co-administered with Propranolol and diltiazem may develop high-degree heart block, hypotension, bradycardia, and heart failure. Digitalis Glycosides: Use of digitalis glycosides and beta-blockers including Propranolol are associated with a decrease in atrioventricular conduction and heart rate. Concurrent use of both the drugs increases the risk of bradycardia. ACE Inhibitors: Co-administration of ACE inhibitors and beta-blockers (e.g., Propranolol) results in hypotension, and setting of acute myocardial infarction. Propranolol antagonizes the antihypertensive effects of clonidine and hence should be administered with caution in patients withdrawing from clonidine. Alpha Blockers: Prazosin in combination with betablockers such as Propranolol prolongates the first dose hypotension. Besides, Propranolol and terazosin or doxazosin administration causes postural hypotension. Reserpine: Catecholamine-depleting drugs including reserpine, may bring about excessive decrease in resting sympathetic nervous activity, resulting in hypotension, orthostatic hypotension bradycardia, vertigo, or syncopal attacks. Inotropic Agents: Propranolol therapy in patients for a longer duration may result in uncontrolled hypertension if administered epinephrine due to unimpeded alpha-receptor stimulation. Therefore, epinephrine is not the choice in the treatment of Propranolol overdose. Isoproterenol and Dobutamine: Beta-receptor agonists such as dobutamine or isoproterenol reverse the effects of Propranolol (a competitive inhibitor of beta-receptor agonists). Besides, Propranolol also decreases sensitivity to dobutamine stress echocardiography in patients for myocardial ischemia. Nonsteroidal anti-inflammatory drugs: Nonsteroidal anti-inflammatory drugs (NSAIDS) reduce the antihypertensive effect of beta-blockers. Hence, co-administration of indomethacin and Propranolol decreases efficacy of Propranolol to bring down blood pressure and heart rate. Antidepressants: The tricyclic antidepressants or MAO inhibitors are associated with hypotensive effects which get worsened on co-administered with beta blockers such as Propranolol. Concomitant use of anesthetic agents such as methoxyflurane and trichloroethylene with Propranolol causes a reduction in myocardial contractility. Warfarin: Propranolol on co-administration with warfarin results in an increase in bioavailability and hence concentration of warfarin resulting in an increase in prothrombin time. Neuroleptic Drugs: Co-administration of neuroleptic drugs such as haloperidol and Propranolol results in hypotension and cardiac arrest. Besides, concomitant use of Propranolol (doses > or = 160 mg/day) and thioridazine increases the plasma concentration of thioridazine and its metabolite (mesoridazine). The plasma levels of Propranolol and hence its effect get increased in presence of chlorpromazine. Thyroxine: Propranolol causes a lowering in the concentration of T3 when used concomitantly with thyroxine. Alcohol: Co-administration of alcohol and Propranolol causes an increase in plasma levels of Propranolol. Migraine Drugs: The concentration of zolmitriptan or rizatriptan gets increased when co-administered with Propranolol. Theophylline: Oral clearance of theophylline gets decreased when concomitantly used with Propranolol. Benzodiazepines: Propranolol causes an increase in the concentration of diazepam and consequently its metabolites. There is no change in the pharmacokinetics of oxazepam, triazolam, lorazepam, and alprazolam when co-administered with Propranolol. Anti-Ulcer Drugs: Cimetidine (non-specific CYP450 inhibitor) when used concomitantly with Propranolol causes an increase in the concentration of Propranolol. The concentration of Propranolol gets decreased when co-administered with aluminium hydroxide gel (1200 mg). Concomitant use of metoclopramide with the long-acting Propranolol does not affect the concentration of Propranolol significantly. Lipid Lowering Drugs: Concomitant use of lipid lowering drugs such as cholestyramine or colestipol decreases Propranolol concentrations. Co-administration of Propranolol with lovastatin or pravastatin, decreases AUC (area under the curve in a plot of concentration of drug in blood plasma against time) of both. Propranolol does not affect fluvastatin concentration when co-administered with it. Does Propranolol have any interaction with Diseases? Propranolol may interact with one of the following diseasess. Care should be taken when you are taking these medications together. Myopathy: Patients suffering from skeletal muscle diseases should be administered Propranolol with high caution. Reports indicate worsening of the skeletal muscle disease such as myopathy and myotonia upon administration with Propranolol. Angina Pectoris: Abrupt discontinuation of Propranolol therapy may lead to worsening of the signs of angina pectoris as well as myocardial infarction in a few cases. It is therefore advisable to decrease the dosage of Propranolol gradually over a few weeks. In case of interruption of Propranolol therapy and exacerbation of angina pectoris, the Propranolol therapy should be restarted and other measurements for the treatment of angina should be followed. When angina pectoris is caused due to coronary atherosclerosis, use of Propranolol causes a decrease in the frequency of angina pectoris. Cardiac Failure: Inhibition of the sympathetic stimulation (that play a key role in supporting circulatory function in congestive heart failure patients) by beta-blockers may result in more severe cardiac failure. Continued use of beta blockers in patients who have never had a heart failure may lead to cardiac failure. Administration of Propranolol in case of patients with severe heart failure causes increased level of blood urea nitrogen. Hypersensitivity and Skin Reactions: Intake of Propranolol is associated with hypersensitivity reactions that include anaphylactic/anaphylactoid reactions. During the course of therapy with beta blockers such as Propranolol in patients with a history of severe anaphylactic reaction to various allergens, these patients respond more strongly to the challenge but not to the usual doses of epinephrine for treating allergic reaction. Propranolol use may also elicit some cutaneous reactions, such as exfoliative dermatitis, Stevens-Johnson syndrome, erythema multiforme, toxic epidermal necrolysis, and urticaria. Nonallergic Bronchospasm (e.g., Chronic Bronchitis, Emphysema): It is advisable to avoid the use of beta blockers including Propranolol in patients suffering with bronchospastic lung disease. The Propranolol use in such patients may result in blocking bronchodilation brought about by endogenous and exogenous catecholamine stimulate on of beta-receptors. Major Surgery: Major surgeries do not require the prior withdrawl of therapy involving beta blockers. However, it may impact the heart whose ability gets impaired to respond to reflex adrenergic stimuli which in turn may augment the risks of general anesthesia and surgical procedures. The effects of Propranolol can be reversed by beta receptor agonists e.g., dobutamine or isoproterenol but may be associated with prolonged severe hypotension. Diabetes and Hypoglycemia: The premonitory signs and symptoms including pulse rate and change in blood pressure associated with acute hypoglycaemia may not appear in presence of beta blockers such as Propranolol especially in case of susceptible insulin-dependent diabetics. Insulin dosage becomes difficult to adjust in such patients. Propranolol therapy in children causes hypoglycaemia irrespective of diabetic or non-diabetic condition during fasting such as in preparation for surgery. Prolonged physical exertion and renal dysfunction also results in hypoglycaemia. Myocardial Infarction: Propranolol causes a decrease in cardiovascular mortality in patients of myocardial infarction (acute phase). Thyrotoxicosis: Beta blockers such as Propranolol may result in the non appearance of certain clinical signs related to hyperthyroidism. Hence, sudden withdrawal of the drug causes manifestation of hyperthyroidism symptoms. Wolff-Parkinson-White Syndrome: Patients of Wolf-Parkinson-White syndrome and tachycardia show who are on Propranolol therapy show severe bradycardia that require treatment with a pacemaker. Hypertension: Propranolol plays an important role in the management of hypertension either alone or in combination with some other antihypertensive agents like thiazide diuretic. Propranolol causes an increased levels of serum transaminases, serum potassium, and alkaline phosphatise in patients of hypertension. Atrial Fibrillation: Administration of Propranolol in patients with atrial fibrillation results in controlling ventricular rate and generates rapid ventricular response. Migraine: Propranolol is recommended for the prophylaxis of headache due to migraine. However, Propranolol is not used in the treatment of a migraine attack that has started. Essential Tremor: Propranolol is recommended for the management of familial or hereditary essential tremor characterized by involuntary, oscillatory, rhythmic movements, especially of the upper limbs. The drug reduces tremor amplitude but not frequency. However, Propranolol is not used for the treatment of tremor associated with Parkinson’s disease. Pheochromocytoma: Propranolol (a beta blocker) in combination with alpha blockers control blood pressure by preventing the increase in heart rate and peripheral vasoconstriction that is required for maintenance of blood pressure. However, the combination is of disadvantage in case of hemorrhage or shock. Hepatic or Renal dysfunction: Propranolol should be used very cautiously in patients of hepatic or renal dysfunction. Glaucoma: Beta blockers (such as Propranolol) cause a decrease in intraocular pressure and interfere with glaucoma screening test. Withdrawal of the drug reverts back the condition to increased intraocular pressure. Human studies suggest a higher level of unbound Propranolol in plasma in case of chinese as against the Caucasians. Studies in geriatric population versus young population indicate that metabolism of S(-)-enantiomer of Propranolol gets decreased in the elderly. Besides, the half- life of both enantiomers i.e., R(+)- and S(-) get increased in the elderly subjects in comparison to the young subjects. Double-blind, parallel, and placebo-controlled study in patients with essential or familial tremor show reduced tremor severity compared to placebo in presence of Propranolol at a dose of 40-80 mg. There are no studies regarding the safety and efficacy of Propranolol in pediatric patients. Studies in patients with norepinephrine-secreting pheochromocytoma pretreated with prazosin indicate blood pressure control in presence of Propranolol at doses of 40-80. Clinical studies in patient with cirrhosis and healthy individual have revealed that steady-state unbound propranolol concentration in was 3-fold in cirrhosis patient in comparison to controls when propanolol was used at an oral dose of 80mg/8 hours for 7 days.